Race Review: The Performance Series 1 – Oasis/Island [10km] (by Rebekah Ong) | JustRunLah! 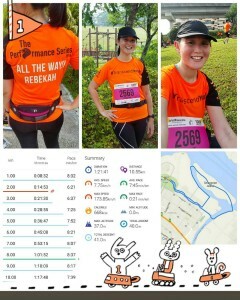 Today was the inaugural run event of The Performance Series. It is the first of five races that promises it’s participants different unique landscapes of Singapore during each event. The 5 landscapes comprise of island, lake, heartland, reservoir and farm, bringing race participants a different and unique running experience each time. This races was created by runners for runners and each of the five races have 3 different categories, 2.5 km, 5 km and 10 km. 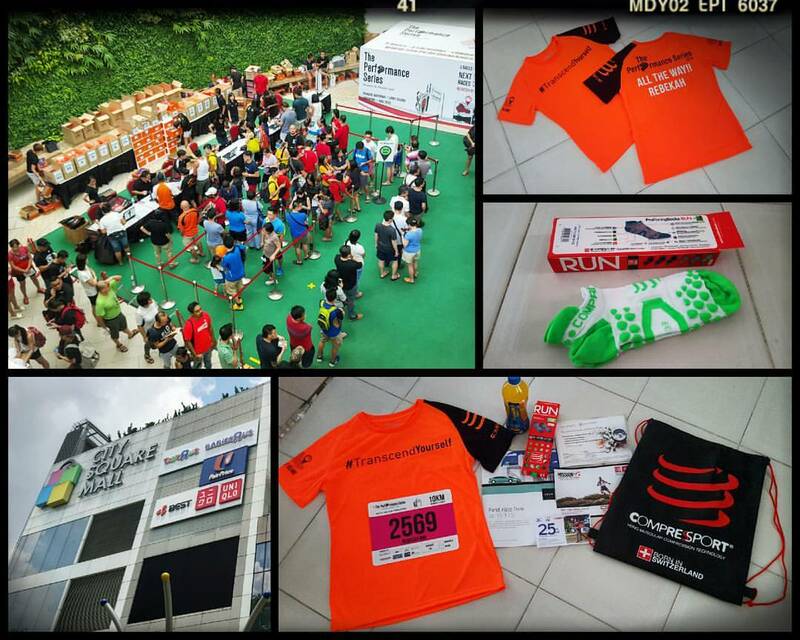 This is to encourage all levels to join in this national movement of running and at the same time help in enhancing the running culture in Singapore and also to empower individuals to take ownership of their health. Race Pack collection was held at City Square Mall over one of the weekends in March. I went down on Day 1 of the collection. Before I arrive, I received a message from one of my friends who was there already, she said that there was a really long queue and she has been in line for about an hour. She was nice enough to offer to collect on my behalf and I quickly accepted and forwarded her the relevant details needed for collection. The race pack was a Compressport Tote Sling bag which contained lots of sponsor vouchers, a bottle of Lucazade Sport drink and a pair of Compressport socks. What I felt could be done better was for the organizers to give us an option on the sock sizes. The ones that they gave me were slightly too fitting and if they had provided me with a pair that was a size bigger, it would have been more comfortable. This is my second run event this week and thankfully I had enough time to rest and get ready for today’s race. Race 1 was held at Punggol Waterway and I took bus 117 and it took me slightly around 40 mins to reach Punggol Interchange. 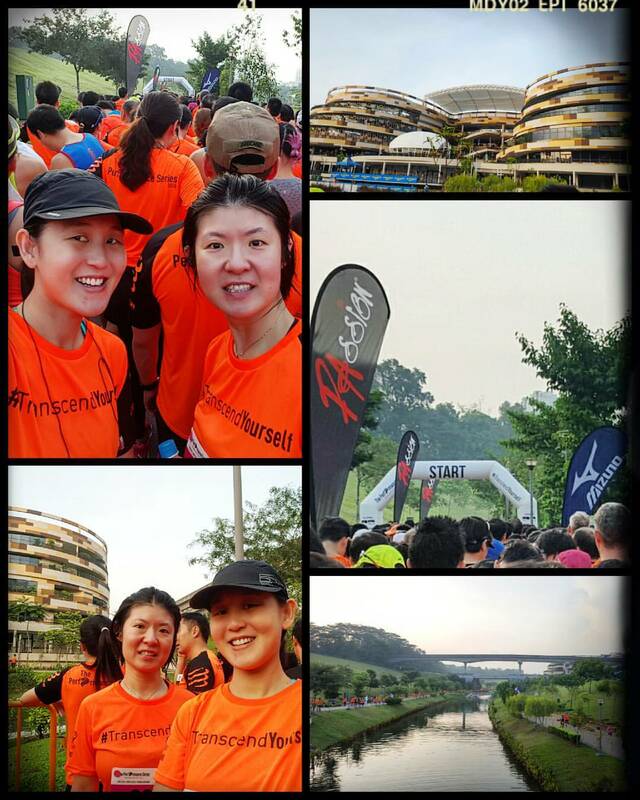 As Punggol Waterway was relatively a new place for major run events, I was glad that the organizers had provided us tips over Facebook on where the race site was. 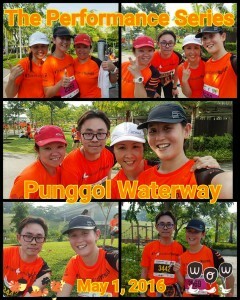 It also helped that I did a recce run at the Punggol Waterway last Sunday before the race. What I thought could have done better was to place direction boards starting from the MRT station advising on how to get to the race site. 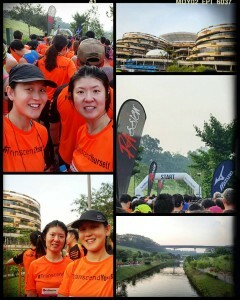 From Waterway Point, it was relatively easy to get there and there were direction boards guiding us to the START Point. Upon arrival, I headed straight for the START Pen. At first we were pretty far behind but we saw other participants heading closer to the front and decide to follow suit. 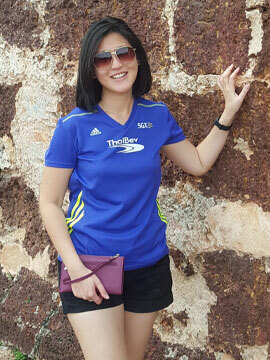 The weather was starting to be warm as the sun had risen but I was glad to know I would be flagged off in the first wave if I were to be flagged off in the second wave, it’ll be such and agony to complete 10km in humid 31 Degrees Celsius weather. We were flagged off about 2 minutes after 07:30 hrs. The first 2 km had slight bottle necks but at least we didn’t come to a full stand still. We had to run up a slope of a bridge but that was okay. The route had gentle slopes but the difficult part had to be along the fifth to eighth km which covered trail. Coney Island was sandy and made it very difficult to jog nor walk. Sand would start to slowly enter your shoe when you do either. At that particular moment, I just felt that Coney Island was never ending and couldn’t wait to exit that place. After we exited Coney Island, there was about a more kilometer of trail before we finally headed back to Punggol Waterway Park. What the organizers did really well was with the planning of the hydration points. They had initially planned 3 hydration points but they increased it to 4 thereafter. That was a really good call by them as the weather was really warm and humid. Having a cold drink really does energizes you. Another thing they did well was the distance route markers! My GPS had not tracked my run properly but luckily there were these marks and that really helped me in know how far I have covered and whether I was making good time. 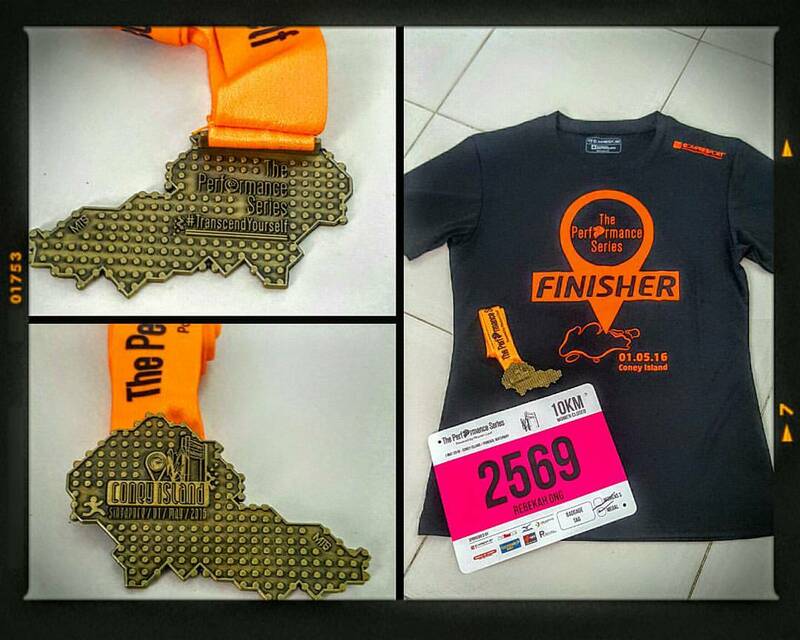 I finished the race in 1 hr 21 mins (unofficial timing), not too bad for my first 10 km run event for 2016. Crossing the Finish line I felt a sense of achievement. Looking at the Finish gantry, it did not have your usual FINISH wordings on it but it said “Well Done” and that was a refreshing change. I made my way up the stairs to the medal collections area. Everything was well labelled and well organised. I collected my Finisher Tee and my medal! I really love the Finisher Tee as it’s cutting was really nice. It can be worn for both exercise and going out, can’t wait to wear it! The medal is also another unique one. It’s just one part of the Singapore Island. Now I’m tempted to sign up for Race 2 cause it’ll be a cool collection piece. The race village was bustling with life after the race with participants meeting up with friends and checking out the sponsors booth. I found a nice shaded spot to sit down and sit down for a while to cool down. When I’ve recovered, I went to find my friends for some post race wefies. Overall I really enjoyed today’s race experience. Congratulations to everyone who participated and complete Race 1 of The Performance Series. Now I’m really tempted on signing up for Race 2 at the Jurong Lakes. Till my next race. Hope you all had a nice time reading this review.